We were well represented at the Christmas on the Hill parade at Staple Hill! Thank you to everyone who went along and marched. 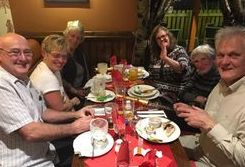 Kim and Megan Simpkins-Jenkins very kindly organised an evening out at the Winterstream Farm for trustees, volunteers and supporters to celebrate the approach of Christmas. From left to right, above are Nigel Litten, Jane Litten, Jane Worth (treasurer), Gerry Watkins (secretary), Carol Phillips and Norman Worth. Christmas Raffle for Bristol DAWG! Just £1 a ticket! all monies to the charity! 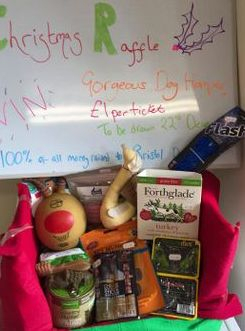 Your chance to win this fabulous hamper for your dog just in time for Christmas! £1 per ticket and 100% of the money goes to Bristol DAWG greyhound and Lurcher Rescue! Many thanks to the following kind people who have generously made donations at Christmastime: Robin and Gail Horsfall, Ann and Robin Potter, Julie Sims, Richard Slaughter, Wendy, Vicky and Roger Hargest, Community Vets (Portishead), Carol Phillips, J and J Lamoon, Daphne and Brian. A massive, massive, massive "thank you" to the following people who stood in the pouring rain for two hours at the Rovers Ground. Think it will be a brilliant collection, however, it won't be counted straight away due to the two inches of rain in the bottom of the bucket!!! Thanks also to the very generous supporters of Bristol Rovers who took the time to stop and pop money in our buckets. Our dogs at the kennels are very grateful to everyone who helped today. Nice hot bath, glass of wine and feet up for Strictly!! Poor Sharon Hunt's dog, Lily, it was her first time fundraising, it has probably put her off for life!! 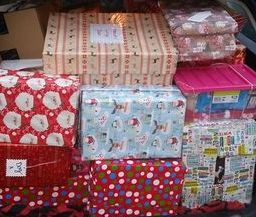 Thank you so much to everyone who donated a present for our kennel dogs via Jo Upton's Christmas shoe box appeal. Our dogs will be very grateful, as are we. 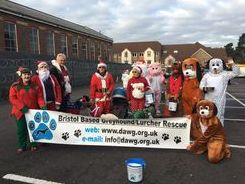 Thank you also to Jo for organising everything - our dogs will have a happy Christmas. We would like to thank Friends of South Glos Strays for the very generous food donation which I picked up from Emerson's Green today. Our kennel dogs will be most grateful. We wish all at FOSS a very happy Christmas and look forward to continuing our association in 2017 and beyond. For one lucky boy this week Christmas has come early!! The very handsome Hansel (now renamed Dennis - love the name) has gone to live in Stroud with his new owners Donna and Jim. Thank you both for giving this lovely lad the best Christmas present ever. Kristie would like to say a big thank you to Santa Paws for kindly donating all these shoe boxes to the dogs in kennels that don't have a home for Christmas. 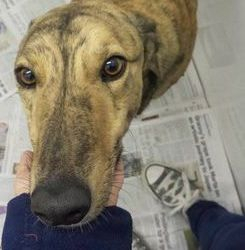 He actually donated to GSDR, but we are going to share them all with the greyhounds. DAWG would also like to say a big thank you to Kristie and GSDR for their generosity in sharing Santa Paws' donations. Today we send our congratulations and best wishes on their wedding day to Kristie Gammon and James Davies. 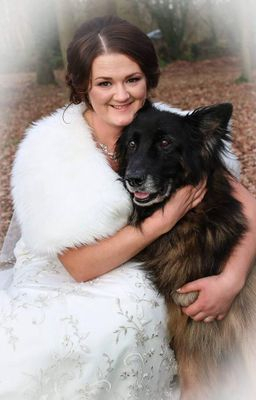 Kristie works at Tonew Boarding Kennels and often goes above and beyond the call of duty by getting up at silly o'clock in the morning to welcome in new dogs, always with James' help and support. Have a wonderful day you two and a wonderful life together.